Hooray for the first group workshop of 2019! This workshop is 5 days before Mother’s Day as well, and many of our past attendees have loved attending our workshops as a mother/daughter outing (hint, hint!). We’re excited to host this workshop at the newly renovated Enjoy Pure Food + Drink at Mission Farms in Leawood as well (if you haven’t been there yet, you will love it!). 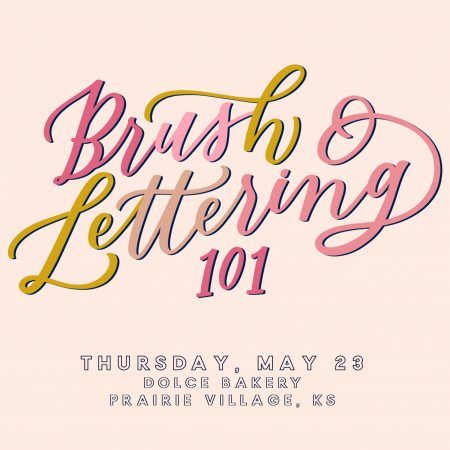 By learning the art of brush lettering, we hope you will walk away having learned a new creative outlet, a helpful skill in your business or career, or just giving yourself gift of self-care and creativity. This is a workshop for beginners who have either never touched a brush pen or calligraphy pen, or those who have just started to dabble in the art. For those of you who think you are “not creative,” have “bad handwriting,” or you are “not crafty,” trust me this workshop is for you, and you can and will learn! Believe it or not, my every day handwriting is nothing special. Hand lettering is much different than hand writing or even cursive. It is a practiced skill, and with time, practice and patience, I truly believe anyone can learn. 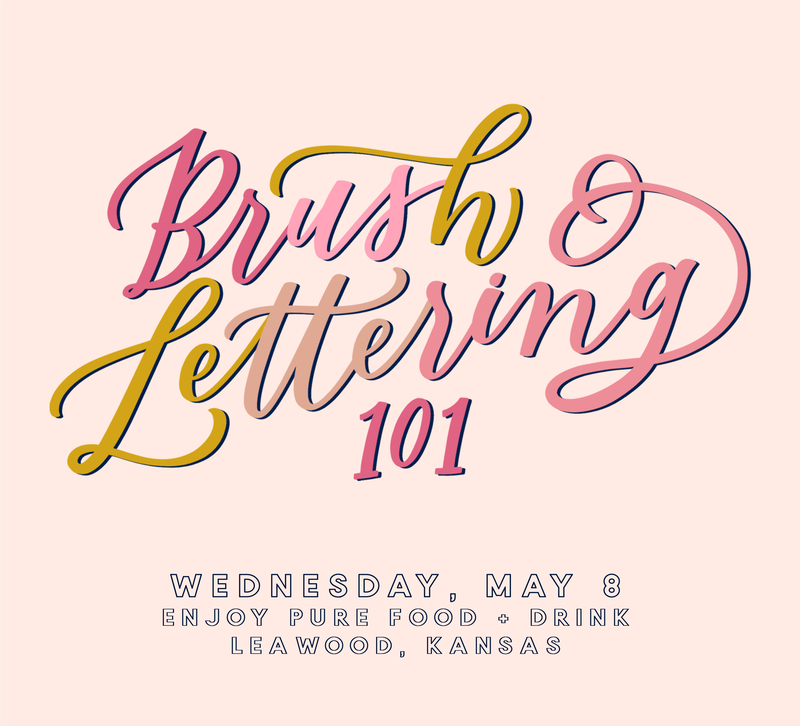 This Brush Lettering 101 Workshop will cover beginner brush lettering techniques and the lowercase alphabet, with 2 mediums, brush pens and a water brush/watercolors. Our workshops are a space to explore creativity and discover a new passion, in an inspiring and welcoming environment! Our workshops have continued to sell out since 2015, and thanks to all of you I have now taught over 1,000 students! Professional artist supplies, including 2 brush pens, water brush pen, watercolor tube, 2 pads of specialty paper, clipboard and more all to take home! A small gift from us to you! We will not be covering traditional, dip pen calligraphy. This is a modern brush lettering class, using brush pen and watercolor techniques. This workshop is limited to 10 students. If you need to cancel for any reason, please let us know as soon as possible. If you cancel 7 days or more prior to the workshop, you may transfer your seat to a future workshop or receive a 50% refund. If you cancel 6 days or less prior to the workshop, you may send someone else in your place or receive a 50% refund. Do I have to be over 16? Yes, we do require attendees to be over 16 years old. The in-person classes last 2.5 hours and we cover a good amount of content. If you have a child under 16 that would like to attend, we would love to have them. We just require an adult to attend with a student, and 2 tickets to be purchased. You can also check out our online workshop here on my website as well, which is a great fit for younger people, too. Yes! I offer private workshops to a minimum of 6 people for corporate groups, friend groups. We offer a per person discount for private workshops, and those can be scheduled by email. I want to offer workshops or events in my own city. Do you offer coaching? We understand that life is hectic, and emergencies can come up. We want to make sure you don’t invest in this class, and be out the money. Please see our cancellation policy above!